It’s not only the humans in my family that feast wisely. The dogs do too. My two fur babies, Enzo and Vespa, are 5 and 4 years old. 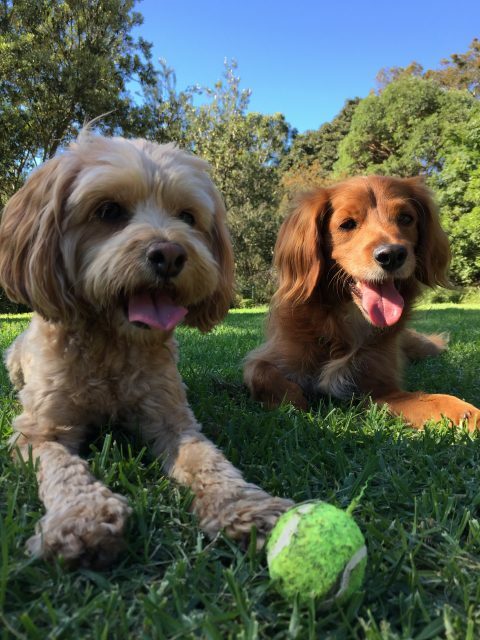 They’re both Cavoodles (a cross between a Poodle and a King Charles Cavalier). I’m a firm believer that a good diet plays a huge role in ensuring dogs (and cats) live a long and disease free life. In the same way that wholesome food keeps us healthy and happy it’s also key to keeping our pets healthy and happy. In a recent article Doctor Becker, a prominent ‘wellness veterinarian’, highlighted ‘…the growing awareness among pet guardians of the link between processed pet food and many of the disorders and diseases occurring in today’s dogs and cats’. This is why at the start of 2017 we changed Enzo and Vespa’s diet to one that’s home made from raw ingredients. It didn’t feel right to put so much effort into our own food and to scoop ‘the boys’ a handful of processed, biscuits (even though we were purchasing top end dry food). At the same time Vespa was a couple of kilos too heavy and Enzo had a habit of looking at his food and then walking away as if to say ‘this isn’t good enough’. 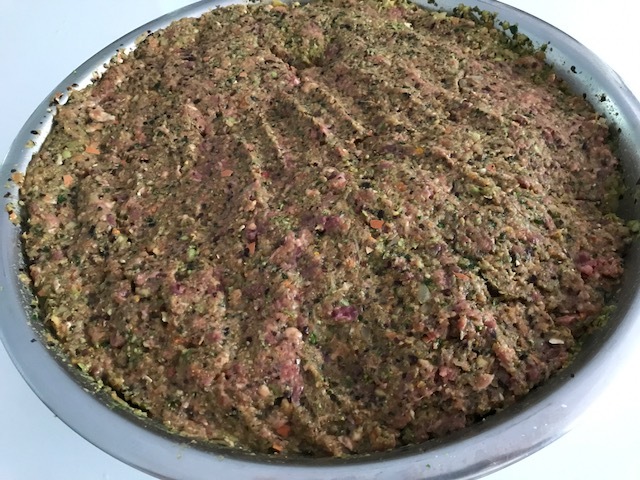 Their raw food mix may not look appealing to us humans but they love it…. Over 20 years ago Australian veterinarian and raw food advocate Ian Billinghurst coined the ‘BARF diet’. Billinghurst suggested that an evolutionary diet is ideal for today’s domesticated dogs. Hence BARF stands for Bones and RAW Foods Diet or Biologically Appropriate Raw Food. Whatever you call it a raw food diet should provide dogs (and cats) with a diet similar to what they ate in the wild. 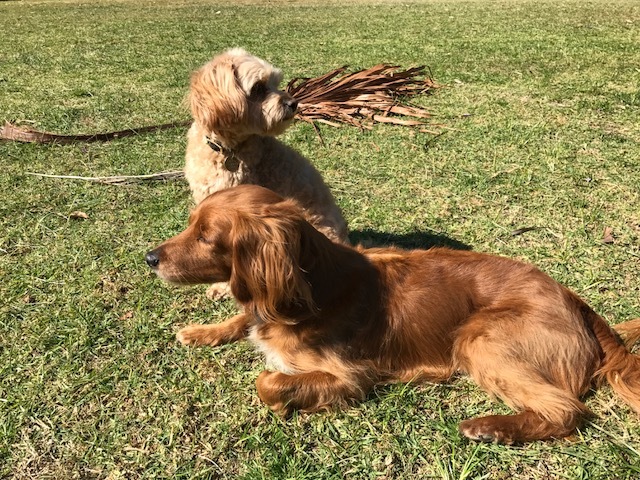 Before you skim forwards to the recipe consider another extract from Dr Becker’s article – ‘Pets need unadulterated, fresh, wholefoods that are moisture dense. They don’t need grains, fillers, artificial preservatives, colors, additives, chemicals, byproducts or processed foods’. Since switching my fur babies to a raw food diet they have both lost 1-2 kilos in weight, haven’t had a single unplanned trip to the vet and Enzo, the fussy eater, now loves meal times. For us there’s no going back. Whether you have a dog or a cat it’s certainly worth considering at least trialing how they respond to a raw food diet. Here I’m sharing a starting point from which you can experiment. The best thing about a homemade recipe is that you pick every ingredient – this brings peace of mind and means you can adapt the ingredients eg to use seasonal vegetables or cuts of meat on special. If you’re already a raw food advocate and have any suggestions for me I’d love to hear. And if homemade raw food feels like too much hard work then consider purchasing from a company that does the work for you – some offer frozen or dehydrated raw diets which make things very convenient for time poor pet parents. Wash the vegetables and fruit (soaking in vinegar is good for removing pesticides) then roughly chop them. In a food processor thoroughly blitz the vegetables and fruit. Add the water gradually to loosen the mixture. Add to the mixture the oregano, sardines, coconut oil, turmeric, pysllium husk, nori flakes, ginger, vinegar and sauerkraut. Blitz until mushy. Add the eggs (with shells), offal meat, ground seeds and sauerkraut and blitz into an even consistency. These ingredients are added last to minimise the impact of heat from the blender. Transfer the mixture into a very large bowl (or two small ones) and with your hands mix in the meat mince. Once fully mixed (3-5 mins) use scales to measure out daily portions. Transfer each portion into a zip lock bag for freezing purposes. If you are making a small batch or your dog eats 500g+ per day then you may only need to freeze a few bags and then keep the rest in the fridge for the next 2-3 days. Find some room in your dog’s diet for raw bones. My recipe doesn’t include bones as organic chicken necks are one of Enzo and Vespa’s regular treats. The ideal daily portion size will depend on your dog’s breed, age, size, activity levels etc. Enzo for example weighs 5kg and receives 250g per day of the diet above. Vespa weighs 9kg and receives 350g. It may require some experimentation to find the right amount. Be treat savvy and supplement a raw food diet with health promoting (not detracting) treats. Enzo and Vespa enjoy dried beef liver, chicken necks, tripe and a product from New Zealand called Ziwi Peak. The latter is fantastic for playing ball at the park and for stuffing in Kong toys. Of course switching from a dry food to a homemade BARF diet does come with extra planning, effort and cost – but I believe it’s ‘swings and roundabouts’ as they say. I’m confident that any additional cost and effort now will be offset by fewer health problems and vet bills, especially as my two fur babies approach old age. Tags: BARF, benefits, diet, Doctor Becker, dogs, homemade, recipe. Bookmark the permalink. that was some nice info…… these two look very cute….. They are so adorable and so lucky to have you! My kids keep asking for a pup… but I can’t imagine one more mouth to feed! Do you freeze portions? Very interesting. Hi Liz – yes we typically make a fortnightly batch and freeze daily portions in zip lock bags. We then add extra water to serve which ensures the dogs stay well hydrated…. 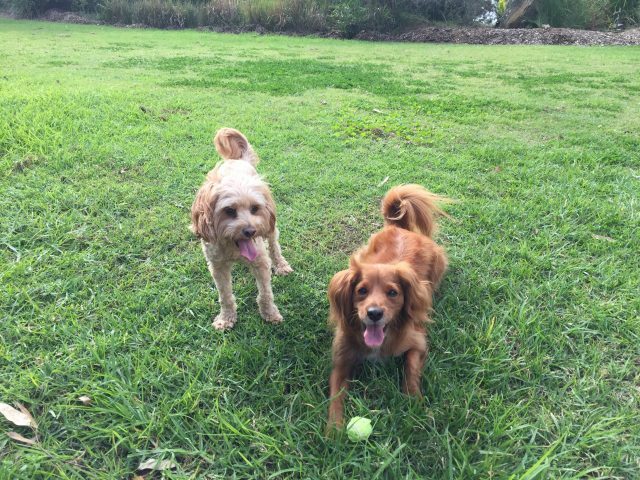 Your fur babies are super cute, Laura! Thank you for posting this! I can’t wait to start making my own instead of getting commercial raw! I see that you do not add bones to your recipe. Are egg shells the only source of calcium, is it sufficient or do you add other supplements? Hi Cecilia – sometimes we do buy a special pet mince that’s included bones but we also supplement with chicken necks too. Also the sardines contains bones too. Hope you give it a go! Hi – thanks for visiting. 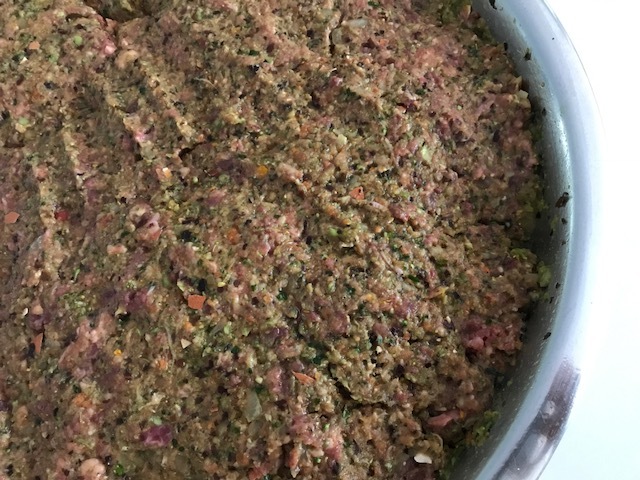 We sometimes add a pet mince from our organic butcher that does include bones but otherwise we use chicken necks as treats to ensure their diet features bones. In terms of other supplements – everything we use features in this recipe – note that as well as the eggs the sardines and broccoli are also top sources of calcium…..